When I undertook the task of examining each frame of TSR's 1980's-era comic ads, I originally intended to only do so with the pair I posted this past Monday. As I published the second dissected-ad post, it occurred to me that I might need to consider performing the same post-mortem procedure on the remaining ads. Well, judging from the interest those posts generated, it looks like my posting schedule for next week has been decided: I'll be taking a look at the remaining ads. I stole a little time yesterday to flip through my collection of 80's comics looking for all of the ads, just to make sure I have a complete set. As a result, I came up with eight mini-adventure ads, running from August, 1981, through September, 1982. 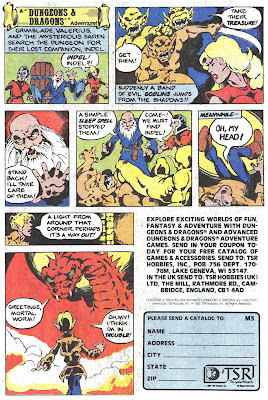 I'm fairly certain that's the extent of TSR's mini-adventure ad campaign, since the next D&D ad I found after that was a boring, product-based ad, and no other mini-adventure ads appeared in any of my comics past that date. Oh Indel, what hijinks will you get yourself into next? I like how the dragon is using "worm" as an insult. Saren has that serious push-up bra action going on, doesn't she? Crazy. Wow, images of my youth just came rushing back. Thanks for the trip down memory lane!